Basic flower cane was the first thing I learned when I got started in polymer clay. I wanted to share it because it’s fairly easy and there are many color variations. For this tutorial, I used pink, purple, and black to achieve a more “retro” look. 1. 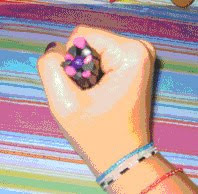 Create a cylinder out of the pink clay by rolling it into a ball, and then slightly flattening it. Then roll out the purple clay into ¼ in thick sheet long enough to cover the cylinder. Save the excess purple for step 3. 2. Roll the purple clay around the pink cylinder and then reduce it down. 3. Create 5 equal lengths of the reduced cylinder. These will become the petals. Then create a length of solid purple the same size. This will become the center. 4. Create 5 more lengths using the black clay. Shape them into triangles by simultaneously pinching the top and pressing down to flatten the bottom. 5. Space the 5 petal lengths around the center, and then place a triangle in between each petal. 6. Roll out ¼ in layer of black to wrap around your entire roll. Reduce it down and cut the cane to create ¼ in to ½ in slices. You may choose to cut the cane in half and reduce each half to a differently. This way you can create focal and accessory beads. 7. Cut the cane to create ¼ in to ½ in slices. You may choose to cut the cane in half and reduce each half to a different size. This way you can create focal and accessory beads. 8. Push a t-pin half way through the slice and stop. Then push the t-pin through the other side to meet the first hole to prevent the clay from puckering. Stick the end of the t-pin into pie plate. Repeat until you have reached the desired number of beads, the bake according to the instructions on your clay package. You really made that easy...I would never have known! Thanks for the do-able project idea! I was looking for a quick easy pattern, for a flower cane...yours is EXACTLY what I was looking for! Thanks so much!